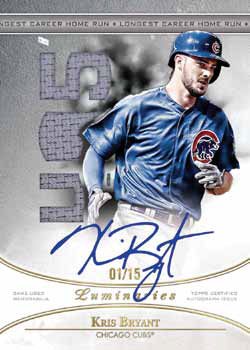 It might not be quite on the level of Dynasty, but 2017 Topps Luminaries Baseball is close. The ultra high-end product has just one card per box. Not only is everything autographed, but every card is numbered to 15 or less. 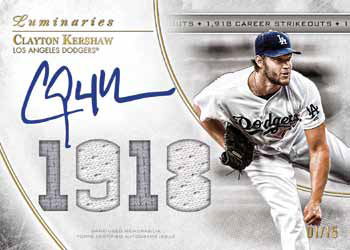 Much of the 2017 Topps Luminaries Baseball checklist is divided up into three broad categories: Hit Kings, Home Run Kings and Masters of the Mound. Within each theme are different combinations of autographs and autographed relics. As far as player selection goes, it’s a mix. Veterans, retired greats and big-name young talent are all included. As the name suggests, Hit Kings is centered on players with a knack for getting on base. Basic Hit Kings Autographs are numbered to 15. Parallels come in Red (/10), Blue (/5) and Black (1/1). As far as signed memorabilia cards go, there are Hit Kings Autograph Relics which have 15 copies each. Red (/10) and Black (1/1) are the lone parallels. Hit Kings Autograph Patches are numbered to 5 and have only Black (1/1) parallels. Closing things out in this department are Hit Kings Autograph Patch Dual Book cards, which are all one-of-ones. A Hit Kings Ultra Book card has ten autographs. That’s definitely a lot, but it pales in comparison to the Hit Kings Ultimate Book, which has 40 signatures. Both of these massive book cards are one-of-ones. 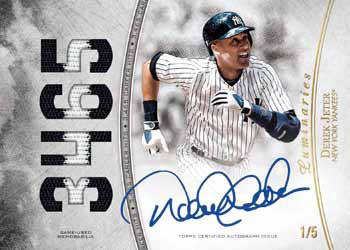 Power hitters past and present are showcased in the various Home Run Kings portions of the 2017 Topps Luminaries Baseball checklist. Base Home Run Kings Autographs are numbered to 15 with parallels landing in Red (/10), Blue (/5) and Black (1/1). Like Hit Kings, there’s a Home Run Kings Ultra Book (1/1) and an Ultimate Book (1/1). The Home Run Kings Ultimate Book ups the ante with a total of 50 autographs on it. Memorabilia is added for Home Run Kings Autograph Relics (/15) and Autograph Patches (/5). Both have Black (1/1) parallels. Relics also have Red (/10) versions. One-of-one dual and triple patch book cards are also inserted. Masters of the Mound Autographs follow a similar pattern as the other basic autograph themes in 2017 Topps Luminaries Baseball. That means 15 copies for base copies along with Red (/10), Blue (/5) and Black (1/1) parallels. 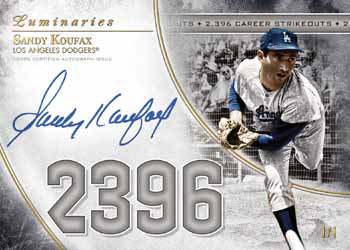 Autograph relics featuring pitchers have 15 copies each while patch versions are numbered to 5. The parallels are similar to previous portions with both having Black (1/1) versions and the relics having Red (/10) as well. The Masters of the Mound Ultra Book (1/1) has ten autographs from big-name pitchers. 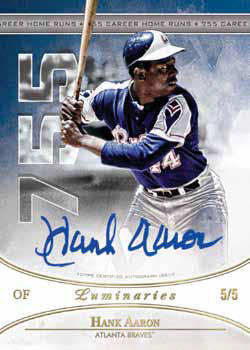 While most of 2017 Topps Luminaries Baseball falls under those three main themes, there are others. The Greatest is a book card with a total of 30 signatures. Letters book cards highlight some of the best patches available from a jersey. Cut Signatures all have one copy each. Some are upgraded with relic pieces and bat knobs.